In Oregon, title to real property can be transferred from one party to another by executing a bargain and sale deed. 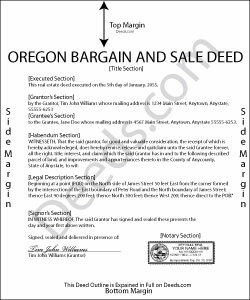 Bargain and sale deeds are statutory in Oregon under ORS 93.860. A bargain and sale deed conveys the grantor's "entire interest in the described property at the date of the deed which the deed purports to convey" but does not provide covenants of title (ORS 93.860(2, 3)). The grantor of a bargain and sale deed is prevented from asserting he held an interest less than the interest conveyed by the deed at the time of the deed, and the deed passes any after-acquired title (ORS 93.860(2)). In Oregon, a lawful bargain and sale deed includes the grantor's full name, mailing address, and marital status; the true consideration paid for the transfer (ORS 93.030); and the grantee's full name, mailing address, marital status, and vesting. Vesting describes how the grantee holds title to the property. Generally, real property is owned in either sole ownership or in co-ownership. For Oregon residential property, the primary methods for holding title are tenancy in common and tenancy by entirety. A conveyance of real estate to two or more unmarried persons is presumed to create a tenancy in common. A conveyance to a married couple creates a tenancy by entirety. Joint tenancy is abolished unless the conveyance is to trustees or personal representatives (ORS 93.180). As with any conveyance of realty, a bargain and sale deed requires a complete legal description of the parcel. Recite the prior deed reference to maintain a clear chain of title, and detail any restrictions associated with the property. The completed deed must be acknowledged by the grantor (and his or her spouse, if applicable) in the presence of a notary. Deeds affecting property in Washington County are subject to a local transfer tax (Chapter 3.04, Washington County Code). If an exemption to the transfer tax applies, the proper application form must be submitted. Forms are available through Washington County's department of assessment and taxation. Record the original completed deed, along with any additional materials, at the clerk's office in the county where the property is located. Contact the same office to confirm accepted forms of payment. This article is provided for informational purposes only and is not a substitute for the advice of an attorney. Contact an Oregon lawyer with any questions related to the transfer of real property. Ronald C. said: My goal was to find the Covenant, Conditions, and Restrictions for my HOA. From what I can read, these documents should be attached to our Deed (single family, patio home in New Hanover County). I am not sure if I have a copy of my Deed. I would need to check my Safe Deposit Box. Unfortunately, I was not successful at finding these documents from your Website. If you can help me find them, I would appreciate that. Reply from Staff: It is most common to obtain a copy of CC&Rs directly from the HOA. Alternatively, they are also usually a matter of public record recorded with the local recorder and you can obtain a copy there. LORIN C. said: This site and service is the best and most easily navigated that I've seen; I'm 80.....and I need...EASY!